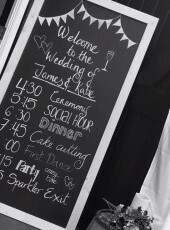 A fabulous over size chalkboard is great for writing your ‘Run of the Day’ or Table Plan on. Hire as our DIY option or have us write it for you for an additional fee. Price of design varies on what is needed so please get in touch for a quote.